Southern Threads was created in 2005 by Terry Manown. She combined her unique sewing talents and experience to produce one-of-a-kind cotton baby gifts. Each item is designed with a special purpose, taking into consideration ease of use and care. 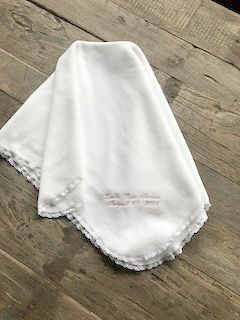 We continually research the finest fabrics available so that we can provide quality products for babies born into any climate in the country at any time of year. All items, except bloomers, are intended for both boys and girls alike. Your choice of graphics and fonts allows you to personalize your gift. Knit and micro fleece blankets are available in script. Flannel blankets are available in either script or block. Southern Threads offers many different fonts for all other items. If unspecified, we will choose the font that looks most appropriate with your name and graphic selected. 100% customer satisfaction is our goal. Upon request, we will email you a preview of your graphic and font choice for approval before production. We always email you a picture of your completed product if it is being sent directly to the gift recipient so that you have a chance to see it. Southern Threads was born out of a love for sewing and a love for sweet, snuggly babies. Our business has grown to include items for toddlers and siblings as well. We hope you will explore our site and find your perfect gift for that special little someone! Local orders, to be picked up, should not go to Paypal. Paypal will request payment which will delete the shipping costs. Instructions for pick-up will be emailed to you. Gift wrap, and enclosure card are available for $2.00, and is available for local pick-up. This gift wrap is pictured on the graphics page.